Deciding to venture out for a bite to eat, I found myself wanting more than the typical dining experience so being that Tengda the Asian Bistro had a variety of options and it was close to UNH, I chose to give it a try The restaurant was located on Boston Post Road, in Milford, right in a beautifully renovated shopping center. Amongst the other stores were Whole Foods, Osh Kosh, and a frozen yogurt shop, which I got pretty excited about to grab after dinner. The location of the restaurant was perfectly placed so I was under the impression that it was going to be a good meal and I was looking forward to eating. I figured Tengda would be perfect fit for a family night out because they have something everyone liked on the menu and the atmosphere was fun. The restaurant itself occupies the corner of a shopping plaza. From the outside, it seems very small, as if it’s just a little shop. However, when you walk in the doors, the restaurant sprawls out before you in both directions. There was a fair amount of other diners seated but nobody else was waiting. We had to decide which section of the restaurant we wanted to sit in, as each section offered different types of food. Directly to the left was a huge dining area for the customers ordering off the regular Asian fare menu and to the right was the Japanese Hibachi station complete with about eight grills and a multi-family seating style. Finally, in the back of the restaurant stood the bar for the patrons who prefer the lighter fare of hand rolled sushi. The dining room was beautiful with elaborate tile floors, unique architecture, and dim lighting to set the mood. The walls were bare aside from the orange geometric patters along the trim and the marble by the sushi bar. Though the décor of the restaurant was very modern and classy, it did not fit with the type of food they were serving. Typically when attending ethnic restaurants, the place is adorned with things representing that culture, however, none of that was seen in Tengda. Even on the Hibachi side of the restaurant, there were no pieces of art or décor that reflected in Asian culture. I can’t speak for Tengda’s sushi or the dinner menu, being that I’ve never had it, but their Hibachi is at best mediocre. After being seated and brought drinks, everyone at the table was given a small salad and bowl of miso soup for starters. The small salad was in fact very small as was the bowl of soup. The salad was freshly prepared but had a dressing on top that I could not acquire a taste for. I also found that there were way too many onions in my soup that it became overbearing and displeasing. Next the chef prepared vegetables, fried rice, shrimp, and a meat of your choice, right at the table, which is fun. There were no problems with the vegetable, shrimp, or the chicken I chose, however, there was nothing spectacular about them; they were just okay. Again, as with the soup, there were too many onions involved with the fried rice and I just couldn’t get over the taste. I even tried to pick around them, which you picky eaters are good at, but couldn’t even get one spoonful without any. Maybe it’s just my own lack of enjoyment from onions but even the professional chef’s on Food Network say all the time that too much of an ingredient can ruin a dish. I assumed that the food from Tengda was going to be top notch because it was located in a good area and the looks of the restaurant made it seem upscale yet the Hibachi food just did not match up. I would like to return, not based on my experience, but to give the regular menu a try. 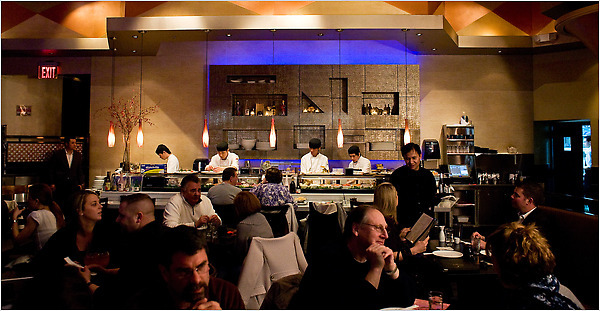 The Hibachi dining experience was exciting because its something different from your average every day meal. The food ordered is cooked right in front of whoever is ordering it and the chef puts on a little show for the guests. There were a lot of jokes, vegetable throwing, and Saki squirting which partially made up for the bad service of the waiters. I had to wait about twenty minutes before I got my soup and salad by which time the chef had already started cooking my other food. It was easy to tell that there was some confusion amongst the waiters because they mistakenly brought my tables’ starters to the table that came after us. I had also ordered a diet coke during my meal at one point, which was never brought, and its never fun to be forced to periodically remind the waiter to bring your drink while you’re dying of thirst. However, the Hibachi chef was engaging, nice, and prompt; there are no complaints about him and the job he did. He was completely understandable and cooperative with the diverse palettes amongst the group of seven people that he had to cook for. He made sure that my chicken was cooked the way I like it and he even put extra sauce on my portion because I mentioned that the teriyaki sauce was my favorite part. The only reason I would be returning to Tengda was if I received a free meal coupon or perhaps to give the non-Hibachi menu a try. Hopefully, their dining room experience will be a bit more organized than the Hibachi one.